Italian utility back Andrea Masi made his international debut against Spain in 1999; only one year after his professional debut for Viadana aged 17. His first cap brought a try from full back but the young Masi would have to wait nearly four years for his next cap, during the 2003 Six Nations. In a trend that would continue throughout his career, Masi's second cap would come in a different position to his first, at outside centre. He was then selected by Italy coach John Kirwan for the 2003 Rugby World Cup, and featured in all of Italy's group games. The 2004 Six Nations was a further opportunity in an Italian shirt for Masi, as he started against Wales and scored Italy's try as they were defeated 44-10. 2005 proved to be a successful season at international level for Masi, as he started all of Italy's Six Nations games in the centre. Later that year Masi also featured for Italy against Australia and in their 30-29 victory over Argentina at the Estadio Olimpico. He missed the 2006 Six Nations through injury, but returned for the Azzurri in summer tests against Fiji and Japan. Masi was back in action for the 2007 tournament, starting in Italy's first ever away win against Scotland at Murrayfield as Italy recorded their best ever tournament finish with a further home win over Wales. He was selected for his second World Cup in 2007, starting four matches during Italy's disappointing group stage exit from the tournament. Following the World Cup, Masi's position in the Italian side would change dramatically. New coach Nick Mallett had designs on converting Masi to fly half as the search continued for a replacement for Diego Dominguez. Masi's limited kicking game brought criticism and a great deal of media attention in the early stages of the 2008 Six Nations, but Mallett continued the experiment for the full five games of the tournament, including the final victory over Scotland. Masi returned to the centres for the summer tour to South Africa and Argentina, but during the 2009 Six Nations he was moved to fullback. A two-year absence from the international scene followed but he returned in some style with a man-of-the-match performance as Italy secured a historic 22-21 victory over France in their penultimate game of the 2011 Six Nations. His campaign ended on a personal high after being named the player of the tournament. 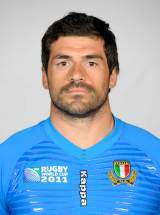 After leaving Top 14 side Racing Metro - Masi opted to join Aironi for the 2011-12 season. However, Masi's arrival at the RaboDirect PRO12 side will be delayed as the versatile back will be a key part of Nick Mallett's side in the forthcoming World Cup.